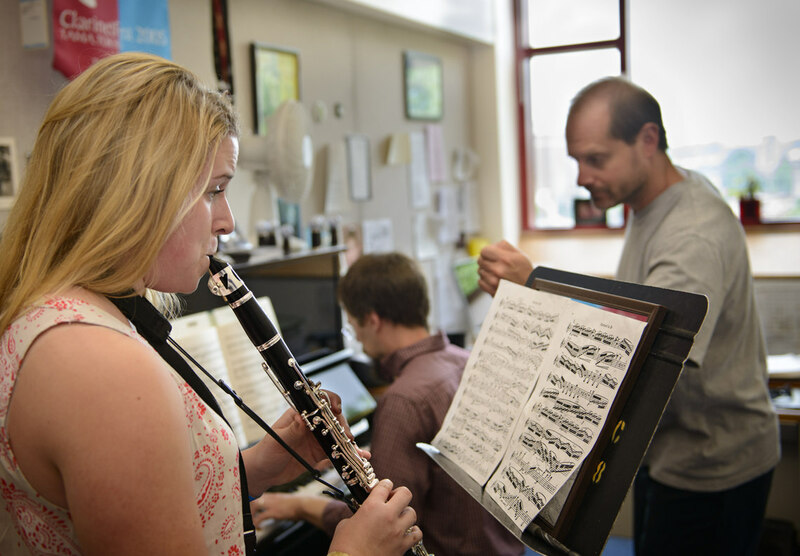 Advanced high school students of woodwind, brass, percussion, jazz, voice, piano and strings can participate in this intensive one-week training period for both day and boarding students. Participants study repertoire with USC music faculty in small chamber ensembles and together in a chamber orchestra culminating in a performance on the last day. 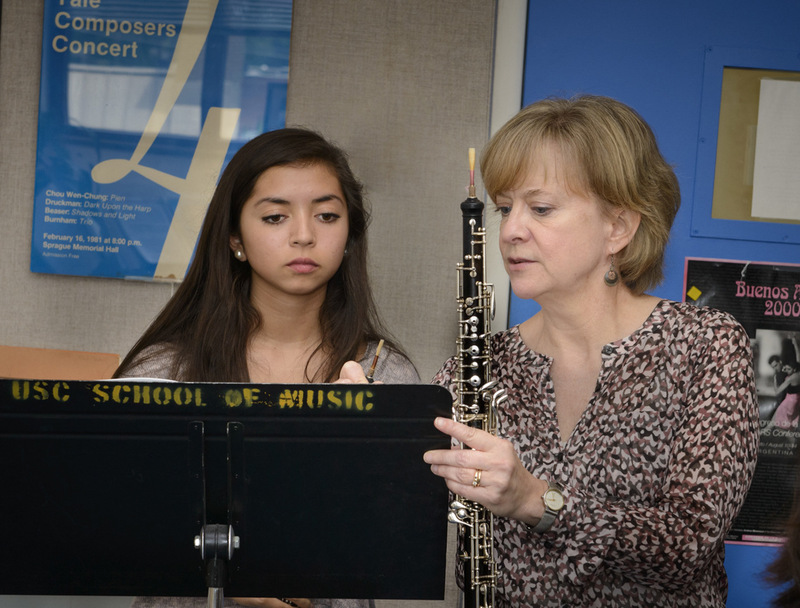 Students who have completed 9th through 12th grade focus on individual performance and chamber music, developing musicianship skills – the listening, rhythmic and ensemble skills that go into making chamber music. 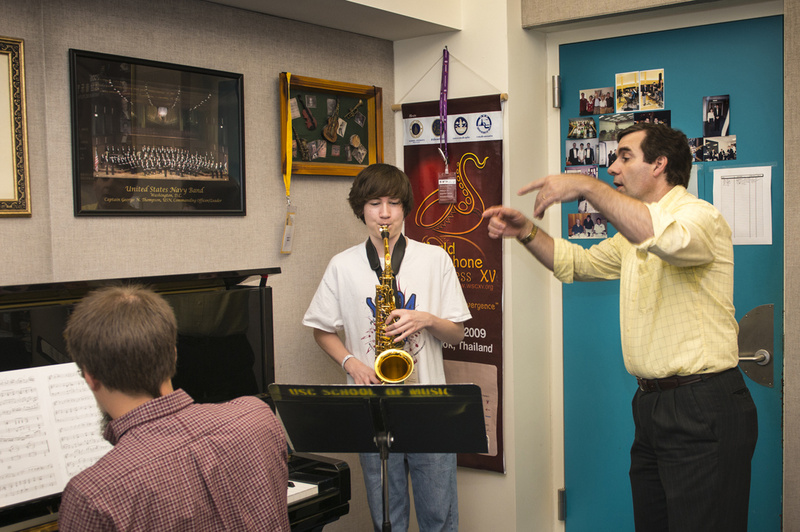 In addition to master classes, chamber music coaching and private lessons, students are offered a variety of activities, including courses in music history, music theory, how to prepare for an audition, and jazz improvisation. 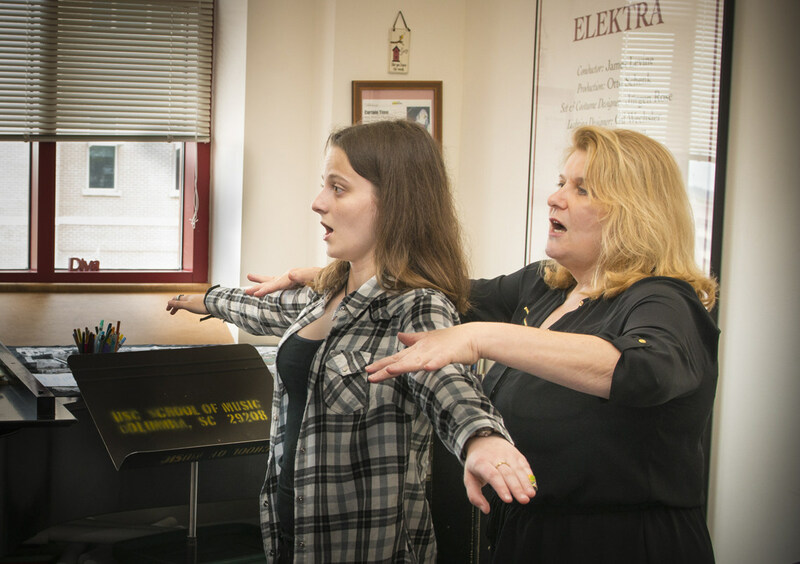 Conservatory participants rehearse and perform solo works with professional accompanists and hear concerts and recitals given by conservatory faculty members. Pianists are also encouraged to apply for the CSMC separately from the Southeastern Piano Festival. Piano students have the opportunity to work in chamber ensembles in addition to daily lessons, master classes and classes with the other conservatory students. Commuting students must live off campus with an adult guardian. A limited number of scholarships are available. All students wishing to be considered for scholarship assistance must submit a taped recording and indicate on the application that they wish to be considered. Include an electronic audio file link or send us a CD recording of 5-10 minutes of you performing on your major instrument (or proof of inclusion in your Allstate ensemble). A recording is required if you wish to be considered for a scholarship. For more information: email Dr. Clifford Leaman or call 803-576-5893. Neil Casey is the assistant director of orchestras at the University of South Carolina, as well as the conductor of the Armstrong Atlantic Youth Orchestra in Savannah, Georgia. At USC, he teaches conducting, violin, chamber music, conducts Opera at USC and the USC Campus Orchestra. Violinist Ari Streisfeld has garnered critical acclaim worldwide for his performances of diverse repertoire and has established himself as one of the foremost interpreters of contemporary classical music. Praised for his “dazzling performance” by the New York Times and “scintillating playing” by New York Classical Review, Dr. Streisfeld is a founding member of the world renowned JACK Quartet. Violinist William Terwilliger has enjoyed an exceptionally active and diverse career as a soloist, recitalist, chamber musician, orchestral musician and teacher. Currently professor of violin at the University of South Carolina, Mr. Terwilliger is also a gifted and dedicated pedagogue, and has given masterclasses throughout the U.S. and in Europe, Asia, Australia and Africa. Sarah Jackson Evanovich is the assistant director of the Suzuki Academy of Columbia & USC (formerly named Suzuki Strings at USC). Sarah is also one of two music teachers at the new Midlands Arts Conservatory in Columbia, SC, a charter school that allows students to spend an intensive three-hour session each day focusing on their art area in addition to their core academic classes. She is currently the president of the Suzuki Association of South Carolina and formerly taught as an adjunct instructor at the University of South Carolina and USC Aiken. Sarah holds a Master of Music degree from Roosevelt University and a Bachelor of Music from the University of South Carolina, both in cello performance. She studied Suzuki pedagogy with Dr. Tanya Carey. She taught cello lessons and classes for several years at the Hyde Park Suzuki Institute and the MAGIC program in Chicago. In South Carolina, she studied with Dr. Robert Jesselson and taught in the USC String Project and other community programs. Joseph Eller is associate professor of clarinet at USC. He has performed solo and chamber music recitals throughout North and South America, Europe and Asia. He was appointed principal clarinetist of the South Carolina Philharmonic in 2012 and has played extra with the Atlanta Symphony Orchestra, the Atlanta Opera Orchestra, Charleston Symphony Orchestra and numerous other orchestras throughout the southeastern U.S.
Clifford Leaman is associate dean and professor of saxophone at USC. He is in great demand as a soloist and clinician and has performed and taught throughout the U.S., Canada, Italy, Spain, France, Slovenia, Sweden, Thailand and in China where he has been a featured guest artist eight times since 2004. Reed Hanna is principal bassoon of Symphony Orchestra Augusta in Augusta, GA. He also performs regularly on bassoon and contrabassoon with the South Carolina Philharmonic, the Charleston POPS!, the Valdosta (GA) Symphony, the Greenville (SC) Symphony, and others. Lauren Watkins Vaughn holds the second flute/piccolo chair with the Augusta Symphony and performs as principal flute with the Aiken Symphony. She has also performed as a guest musician with the Greenville Symphony Orchestra, SC Philharmonic and the Long Bay Symphony. In addition to her private flute studio in Columbia, Lauren is on faculty at Newberry College and Limestone College and regularly presents guest clinics and workshops to high school students across the state. William Anonie is the trumpet Instructor at the University of South Carolina Aiken and a doctoral candidate at the University of South Carolina Columbia. He has served as a Graduate Teaching Assistant at the University of South Carolina Columbia, and at Wichita State University. While in Kansas, Mr. Anonie was Second Trumpet in the Wichita Symphony Orchestra. He has also performed with the South Carolina Philharmonic, Wichita Grand Opera, Symphony Orchestra Augusta, Florence Symphony, and Aiken Symphony. In addition to performing throughout the United States, Mr. Anonie has performed in Italy, Spain, Canada, and Taiwan. His teachers include David Hickman and James Ackley. Ronald Davis is professor of tuba and euphonium at USC and is principal tubist with the South Carolina Philharmonic Orchestra. As an orchestral player he has performed with the Augusta Symphony Orchestra, the Santa Barbara Symphony, the Los Angeles Master Chorale and Sinfonia Orchestra under Roger Wagner, the Los Angeles Philharmonic, and the Charleston and Charlotte Symphonies. Scott Herring directs the percussion area at USC. He frequently appears as a guest artist with university percussion ensembles across the U.S. and has presented concerts and clinics at PASIC 1996, 2002, 2006 and 2011. 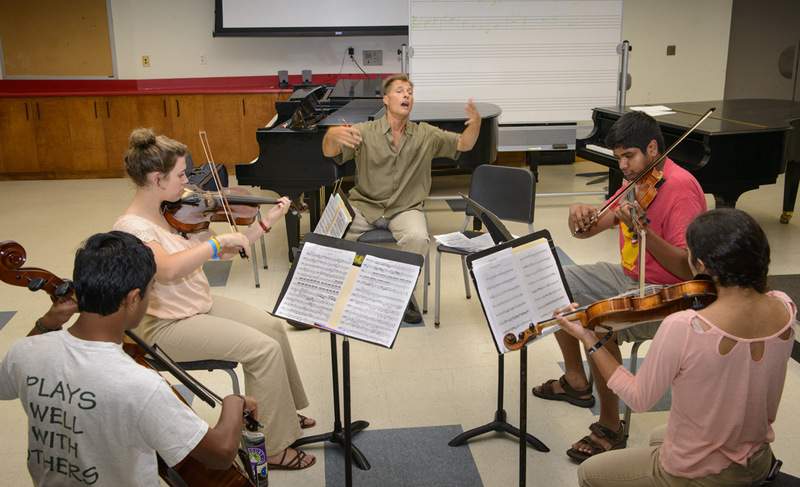 Professor Charles Fugo teaches applied piano and coaches chamber music at USC. He is the recipient of the 2008 Cantey Outstanding Faculty Award and has played collaborative recitals at New York City's Weill Recital Hall at Carnegie Hall. 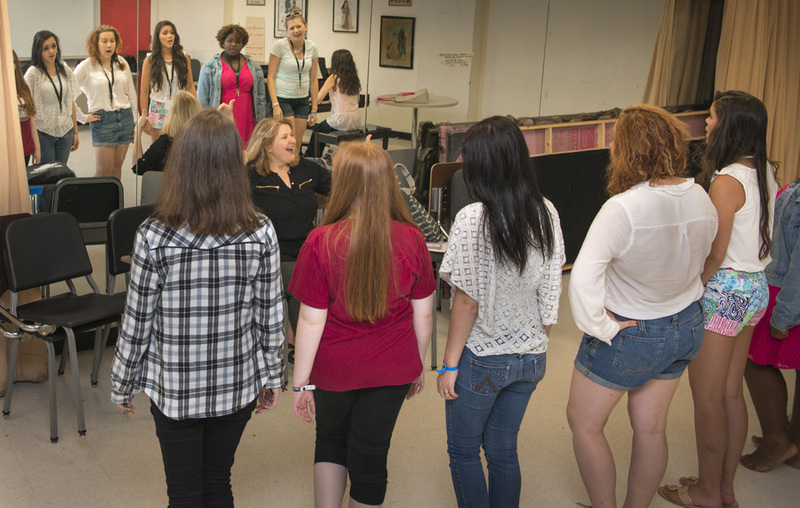 Mezzo-soprano Janet Hopkins is associate professor of voice at USC. She has toured extensively with The Metropolitan Opera and has performed in Japan and throughout the U.S. She has appeared at Carnegie Hall and at the opening ceremonies of the 1980 Winter Olympics in Lake Placid, NY. High school students participate in intensive training.